ANOTHER Farage F*** UP SHAMES EUkip DRAGGING THE PARTY INTO HIS GUTTER! 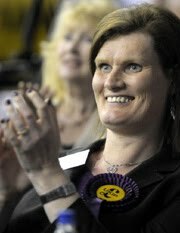 Add a commentRecommend The row between West Midlands MEP Nikki Sinclaire and her own party has taken a bizarre twist after she admitted she didn’t know whether she had been expelled or not. In the light of the shameful last sentence it is kind of a good job the Nazi Party isn’t still extant because if it had been and it paid better to sell out ones principles The Faragista Fan Club would have been in there with all the alacrity of a rat up a drainpipe! To understand just how vile the EFD really is CLICK HERE it is also well worth remembering that EUkip members and voters who thought they were voting for UKIP deserve some protection from elected representatives with ethics, morality and integrity as no decent person could reasonably expect even someone as bereft of morality as Farage would form a Pan EU Political Party grouping with the EFD as you will well know The Lega Nord were chucked out of the IndDemGrope with Farage as chairman due to its obscene extremist racist and violent behaviour – who would expect the undertaking to include the corrupt! Farage and his fatuous errand boy NuttAll would be well advised to seek competent (NOT Bent & Manure – Michael Zuckerman’s one man band) with regard to Article 3 of The EU law before they find themselves compensating Nikki Sinclaire MEP through the High Courts for her loss of over 20 years of income as an MEP etc. etc.